Robert Streiffer rightly argues that attributing beliefs to people based on their actions may lead one to false conclusions about their beliefs. [I]f you are attributing beliefs to people on the basis of their actions, rather than on what they say their beliefs are, it must be kept in mind that the actions in question are not the product of people’s beliefs about the moral status of NHPs taken in isolation. Rather, the actions are the product of (a) their beliefs about the moral status of NHPs, taken in conjunction with (b) their beliefs about the harms of research and (c) their beliefs about the value of the research. His comment was in response to my claim that those conducting harmful experiments on monkeys or those approving the research – as Streiffer does in his role as an ACUC member – must believe that monkeys have almost no moral status and that even a researcher’s whim is sufficient justification for using monkeys or other animals in ways certain to harm them. Streiffer strongly denied that he holds such a position. My perception and explanation for why he and others support experiments on monkeys must therefore, he seems to imply, be erroneous. (c) their beliefs about the value of the research. Strieffer seems to be arguing albeit implicitly that words should have precedent over actions when trying to divine a person’s actual beliefs. He has in the past pointed to the language in the regulations governing the use of some animals in some research that appear on the surface to imply some ethical weighing. In actual fact, ethical weighing occurs rarely in research using animals but is overt and required in research using humans. See my essay "The Ethics Underpinning Oversight" November 28, 2010. People’s actual, operational beliefs about the moral status of monkeys (or any other belief, it seems to me) can be determined or gleaned much more accurately by their actions in settings that give them an option of behaving one way or another. No matter what someone claims, their actions are telling. No matter how honest one claims to be, if he or she repeatedly engages in fraud, theft, plagiarism, lying, etc., claims of honesty will ring hollow. It is common to hear from the industry that those using animals “respect” them and consider it a “privilege” to use them and wish there was some other way. But how would researchers at a university or elsewhere behave if they genuinely respected the animals they used? At a minimum, it seems reasonable to expect that surgical suites would be kept clean, yet UW-Madison has been cited recently by the USDA for not keeping such facilities clean. People’s operational, as opposed to their stated beliefs about the moral status of animals can be surmised by observing their actions. In circumstances where one’s beliefs could be expected to guide one’s behavior, that behavior will be a more accurate measure of a person’s beliefs than their public claims. Streiffer seems to imply that in most instances researchers may believe that the harms to the monkeys and other animals are not very great. But if this is true then they must be ignorant of the use of monkeys on the whole because even monkeys not used in an experiment suffer from chronic diarrhea and signs of confinement-induced stereotypic behavior (pacing, spinning, odd postures, over-grooming, etc) and self-mutilation. Just keeping monkeys in the typical laboratory setting is clearly and demonstrably harmful to them. See for instance Stereotypic and self-injurious behavior in rhesus macaques: a survey and retrospective analysis of environment and early experience. Lutz C, Well A, Novak M. American Journal of Primatology. 2003. But maybe they actually do recognize that the harm is great, which I believe even a casual observer would recognize. If the harm is great, it appears that only Streiffer’s third point could salvage his claim that vivisectors don’t consider the monkeys used to have a very low moral status:(c) their beliefs about the value of the research. The industry and its shills are wont to claim that essentially every advance in healthcare is the result of experiments on animals and moreover, research using animals is a veritable fount of new treatments and cures. A more sober look at the history of medicine and public health coupled with the current concern over the woeful lack of results (benefiting actual patients) from basic research suggests something much different. A friend recently asked me for a good citation for my observation that sanitation and providing clean water are far and away the most significant advances in public health, ever. I hadn’t made quite this bold of a statement, but I am now confident in doing so. Interpretations of the retreat first of epidemic diseases, and also of the increase in life expectancy, have been hotly debated. Some maintain the mass of the population was slowly but surely becoming less pauperized, and was enjoying better nourishment and hence improved health. Others argue that improving health was not due to rising prosperity but to better environmental salubrity due to public health measures, reducing the disease risks to which the hungry huddled masses were exposed. Historians have distinguished between the retreats of epidemics in the eighteenth century and of endemic diseases in the nineteenth. Since plague was probably halted by the cordon sanitaire along the Habsburg border with the Ottoman empire, public health measures (‘medical police’) probably contributed to the reduction of epidemics. Smallpox vaccination from the early nineteenth century served to make epidemics less severe and frequent. The decline of plague and smallpox would thus have nothing to do with nutrition standards but some link with public health action. Endemic diseases such as tuberculosis and infant diarrhoea, by contrast, do seem to have been made more sever by under-nutrition. The reduction in such diseases might be linked to wage improvements. In either case little that personal physicians did was reflected in improved health. Did public health measures actually do any good? The distinguished epidemiologist Thomas McKeown (1912 – 1988) maintained that reductions in deaths associated with infectious diseases (air-, water-, and food-borne diseases) cannot have been brought about by medical advances, since such diseases were declining long before effective means were available to combat them. Applying much the same argument to sanitary measures, McKeown concluded that resistance to infectious disease must have increased through improvement in nutrition. Overall he mapped out three phases: a rising standard of living from about 1770; sanitation measures from 1870; and better therapy during the twentieth century. McKeown, however, underestimated the effectiveness of the public health movement. Changing public opinion, the labors of medical officers of health, the creation of filtered water supplies and sewage systems, slum clearance, the work of activists promoting the gospel of cleanliness, and myriad other often minor changes – for example the provision of dustbins with lids, to repel flies – combined to create an improving urban environment. Porter’s observations are compelling to me, but I wasn’t fully satisfied that he presented the facts in a way that would lead an uncritical reader to the same conclusion as mine. As a consequence, I began reading a little more about the history of public health. George Rosen’s 1958 A History of Public Health is a classic in the field. It was reprinted in an expanded edition by The Johns Hopkins University Press in 1993. With the expanded and helpful bibliographies (there are two) it is just over 500 pages in length. For those with an interest in this area of study, I recommend it; I have many pages marked and passages starred. This citation first led me to Thomas McKeown and R. G. Record’s “Reasons for the Decline of Mortality in England and Wales During the Nineteenth Century.” Population Studies, Vol. 16, No. 2. (1962), pp. 94-122 which is an earlier less detailed account of McKeown’s thesis and includes some graphical data not in the later work. His thesis is more fully developed and a few potential errors corrected in The Modern Rise of Population. The ongoing interest in McKeown's ideas, not only among historians but also among policymakers addressing contemporary issues, is striking. What accounts for his work's remarkable durability? Why has the influence of the McKeown thesis persisted even after its conclusions were discredited? In part, his writing continues to generate responses because many scholars believe that although McKeown's analysis was flawed, his underlying ideas regarding the effects of poverty and economic well-being on health were essentially correct. More broadly, McKeown's influence has continued to be felt because his research posed a fundamental question that has lost none of its relevance in the decades since he began writing in the post–World War II era: Are public health ends better served by narrow interventions focused at the level of the individual or the community, or by broad measures to redistribute the social, political, and economic resources that exert such a profound influence on health status at the population level? McKeown argued that the dramatic decline in the death rate was due to the decline in mortality from infectious disease. On this point, there is wide agreement. The controversy arose because McKeown argued steadfastly that the largest share of this decline was unrelated to the work of the sanitary movement, but rather due to the decline in tuberculosis which he argued was the number one cause of death from infectious disease and that the decline was due largely to the improvement in diet. The controversy is of absolutely no consequence to the well respected broadly acknowledged fact that there was a dramatic drop in the death rate from infectious disease prior to any accurate understanding of the cause of these diseases or effective treatments. Thus, experiments on animals played absolutely no role in the most dramatic drop in death rate in human history. Keep in mind that the pro-vivisection organizations argue that essentially all medical progress is due to animal experimentation, and whooping cough is no exception. (Just google whooping cough animal research.) The whooping cough example has implications for the larger question at hand, namely the actual opinions of vivisectors vs their claimed opinions. I will come back to this below. In the meantime, consider the dramatic decline in mortality that occurred in the nineteenth century prior to any meaningful medical therapy or prophylaxis, or even knowledge of microorganisms, as a sort of bookend to the history of modern public health advancement, at the other end, is the modern critique of the basic research enterprise. Lies, Damned Lies, and Medical Science. David H. Friedman. Atlantic Monthly. 2010. Where Are the Cures? Sharon Begley. Newsweek. 2008. Comparison of treatment effects between animal experiments and clinical trials: systematic review. Perel P, Roberts I, Sena E, Wheble P, Briscoe C, Sandercock P, Macleod M, Mignini LE, Jayaram P, Khan KS. BMJ. 2007. Translation of Research Evidence From Animals to Humans. Daniel G. Hackam, Donald A. Redelmeier, 2006, JAMA. Why Most Published Research Findings Are False. John P. A. Ioannidis. PLoS Med. 2005. Where is the evidence that animal research benefits humans? Pound P, Ebrahim S, Sandercock P, Bracken MB, Roberts I. BMJ. Does animal experimentation inform human healthcare? Observations from a systematic review of international animal experiments on fluid resuscitation. Roberts I, Kwan I, Evans P & Haig S. BMJ 2002. At one end of this tableau is the largest decline in mortality in human history - in the absence of animal research, and at the other end, the promised benefits of the modern basic (animal) research paradigm are apparently lacking. Between these bookends lies the entirety of modern medical research. I am not implying here that no benefit has resulted from the use of animals. For instance, Robert Koch’s 1879 paper on the etiology or cause of infectious disease was based on his work with animals. While his work resulted in no immediate advance in treatment, it did explain the phenomenal results and gave more authority and impetus to the hygienic/sanitation movement’s efforts. The point in calling attention to the dramatic progress that occurred prior to Koch is that it demonstrates the real and significant progress that is possible without the use of animals. This severely undermines claims that animal experimentation is necessary. The growing body of systematic reviews and reports questioning the overall results of basic research implies that the value of the research that is taking place is suspect. This takes us back to Streiffer’s third point: That researchers and their supporters’ beliefs about the moral status of NHPs must be considered in conjunction with (c) their beliefs about the value of the research. It seems to me that an informed unbiased observer would have to seriously question the value of research with monkeys (or any animals) in light of the history of public health and the crisis the basic research enterprise is facing. Claiming that the value of the research is high seems unreasonable and unsupportable. 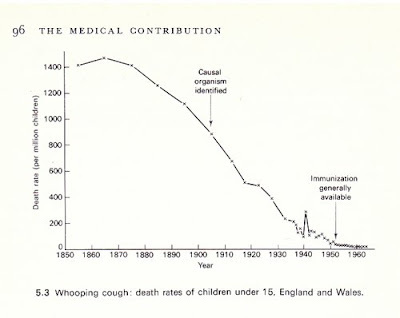 Look again at the graph depicting the decline in deaths from whooping cough. I believe that if there were no vaccine for whooping cough, that research using animals would be underway today in the effort to produce one. This is a hypothetical situation, but given the small number of people afflicted with some of the maladies being studied today, I think it is a reasonable assumption. If it is, then we can look at the graph as a sort of measure of the actual sympathy and moral concern those who propose, approve, and engage in animal experimentation actually hold for the animals they use. By the time the vaccine was generally available, the mortality rate had already collapsed. Yet someone asking for permission to use monkeys to develop a vaccine today, assuming there wasn't one, would – without any doubt – be given the go-ahead, even though the disease is no longer a major threat. That is, even a relatively insignificant gain would be deemed adequate justification to infect and kill monkeys. If you think this is an unreasonable assumption, consider the very limited importance and value of UW-Madison primate vivisector Richard Wiendruch’s caloric restriction studies. In summary, Robert Streiffer accurately I think observed that when attributing beliefs [about the moral status of monkeys] to people on the basis of their actions, rather than on what they say their beliefs are, it must be kept in mind that the actions in question are not the product of people’s beliefs about the moral status of NHPs taken in isolation. Rather, the actions are the product of (a) their beliefs about the moral status of NHPs, taken in conjunction with (b) their beliefs about the harms of research and (c) their beliefs about the value of the research. Given the very real demonstrable harms and the information available regarding the questionable value of the research, it is fair and likely accurate to surmise that those using monkeys and approving their use have very little actual sympathy or moral concern for them, in spite of public pronouncements to the contrary. I thought that you opposed the research based on ethical grounds. But now you are trying to argue the science is actually on your side? You are starting to sound as an anti-vaccination activist. Are you insinuating vaccines have not helped to reduce the death rates in the human population and that animal research was unnecessary for their development? As you probably know, those performing the investigations are not alone in thinking animal research is necessary and beneficial. The Surgeon General, the NIH Director and all major Public Health officials will state the same. If you disagree, your time would be better spent knocking on the NIH Director’s door. Visit Bethesda and make your point there. Rick, now you just need to establish that most animal researchers agree with the conclusions of the references you cite, agree with you about the implications of those conclusions for the value of their own specific research, and agree with you about the severity of the harms imposed on animals in their research. I think those are the steps still needed, in terms of pinning down each of the three kinds of belief relevant to one's approval of animal research, in your argument for the conclusion that most animal researchers believe that animals have no, or virtually no, moral status. "Animal usage is not a moral or ethical issue."